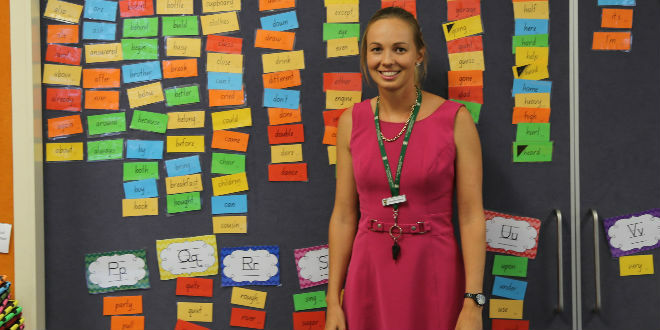 Busy time: Anne-Marie Westby in her classroom at St Ita’s Primary School, Dutton Park. Anne-Marie Westby is a Year 2 teacher at St Ita’s Primary School, Dutton Park, and since September she has taken on the responsibility as the Summer Surf Girl representative at Point Lookout Surf Life Saving Club, North Stradbroke Island, raising vital funds. Q. Did you always want to go into teaching? A: No, I think originally I wanted to be a marine biologist, then I wanted to be a TV presenter, before taking a bit of time off to go into a media and communication course. I deferred that for a year and became a learn-to-swim teacher. That was the stage I realised I really wanted to be a teacher. I was always going to go into the Catholic system – all my schooling was in Catholic schools. With ACU, I actually didn’t know much about the university at all. I was enrolled at QUT and it wasn’t until a friend of mine brought ACU to my attention, I decided to go. The course covered every aspect of teaching including a religious grounding. I was really lucky and changed my preferences right before they were due; it was a much more intimate environment to study. Q. How did Point Lookout SLSC become such a big part of your life? A: We originally lived in Bardon and moved down to Cleveland when I was five, I think. Mum and Dad didn’t know anyone in the area at all; we had a family friend who was involved in the surf lifesaving thing, so every Saturday we’d go over. I started in nippers as a seven-year-old and progressed from there into the club. It gave Mum and Dad a network to settle down and gave me friends that I’ve grown up with and am still close to now. Of course my love for the ocean and Straddy was always a huge factor. Q. How did you come to be the Summer Surf Girl representative? A: I’ve had my eye on it for a couple of years; I’d had a few friends who have gone through and done the program. My club as far as I can remember has always been very supportive of the competition and had entrants most years, with people aspiring to do it. I’d always be watching on with my friends and other people going “Wow”, just in awe of what these other girls were doing. So it was always something I said I’d like to do but through university I never really thought the time was right trying to keep up with studies, and then my first year of teaching. It was halfway through last year when the program was sent out I thought, “Yep, now is the right time”, so I put my hand up and here we are. Q. Has the experience been what you expected? A: Iím not going to lie to you; it’s been very difficult, it’s a lot of work. The Summer Surf Girl program has two tiers. One is community awareness – on my school holidays I’ve been going and doing programs – and on top of that is the fundraising, so once a month we plan a fundraiser. So it has been challenging, trying to balance fundraising, my work as a teacher and then having a social life thrown in there somewhere. In saying that, it has been really great for me personally. I’ve learnt so much from an event and time-management standpoint and had a really great support group as well. My mum and dad have been great throughout the whole thing and we also have a little sub-committee at the surf club. It’s definitely not just me standing there doing it all. I have got a lot of support, which makes it a lot easier. Q. What have you been able to convey of the surf lifesaving values youíve learnt to your students? A: Volunteering has always been something that’s been instilled in me growing up in a surf lifesaving environment. I always try to promote to my children that we don’t necessarily have to be doing something to get something back. I’m always trying to encourage them to help someone out for the good feeling you get from it. And that is really hard for children especially in an industry where people give out awards left and right. Rewards are part of learning for them, so it is really difficult to take that part away and say, “Look, you don’t really need to get anything for it”. I’ve tried to transfer that over and also just in general of giving something back because you can. Q.What legacy do you want to leave from your time in the job? A: For me, I try to not take things too seriously. Itís never been about winning, for me; it’s always been about just doing it because the surf club has given me so much and been such a big part of my life. I’d probably like to show people not to think too much and just relish it and obviously raise a lot of money for the club.